How Does Geology Affect Groundwater Availability? 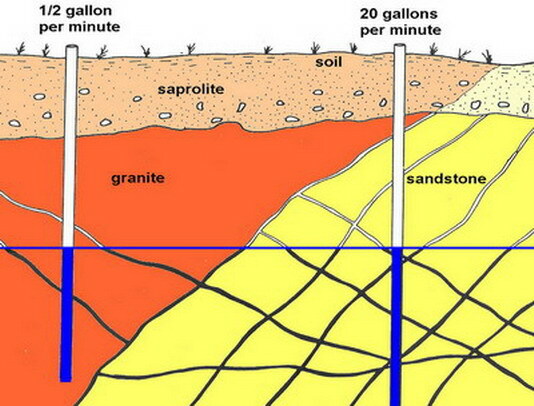 Understanding the nature of the bedrock geology is critical to determining the quantity of groundwater that can be pumped from a well at a given place. In some parts of the world, bedrock consists of sedimentary layers that have abundant pore spaces between individual mineral grains. These layers can form laterally extensive aquifers, or conduits for groundwater movement, that are at predictable depths, and from which seemingly unlimited quantities of high-quality groundwater can be pumped. In these areas, groundwater is the obvious solution for public water supply needs. Cartoon cross-section showing fractured bedrock aqjuifer. Fractures are saturated with water below the water table (horizontal blue line). Bedrock geology determines the density and distribution of underground water-bearing fractures, and the nature of the soils and saprolite that are derived from weathering of the rock. Different rocks contain more or less fractures that may or may not be interconnected with each other. The degree of interconnection among fractures, and their overall ability to move water, has a great deal to do with how productive a water well will be that intersects the fractures. Different rocks also make different soils when they weather, and the type of soil impacts its ability to absorb rainwater that falls at the surface, and transmit the water to bedrock fractures beneath. In central Virginia, bedrock geology is very complex: each color and pattern on the geologic map represents a different type of rock. 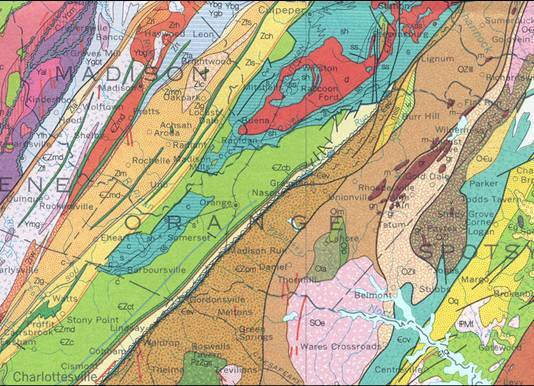 Portion of the 1993 Geologic Map of Virginia showing geological complexity in central Virginia. Each color/pattern on the map represents a distinct type of bedrock. Another main purpose to consider jailbreaking is that it starts to unlocking the phone the window. They’re actually quite unique although unlocking and jailbreaking would seem quite simple to get confused as indicating exactly the same point. To new jailbreak a cellphone way to get it an unlimited range of access to thirdparty applications, unlocking the service is referred to by the iPhone. An iPhone that�s been unlocked has had its Sim-lock broken, that allows it have comprehensive compatibility with any company the consumer chooses to subscribe it to. A iPhone doesn’t instantly imply as opposed to individual needs that the device can be subscribed to any carrier, nonetheless it does mean that the telephone at the least has the potential.